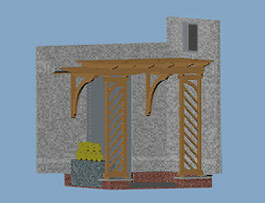 For pergolas and large custom projects we can provide our customers with two and three dimensional renderings. These aid in visualizing the final structure, thus eliminating any surprises. Below are a few examples of our presentation capabilities. Click on drawings for enlarged image. 1. An interesting use of posts and a central arch focuses attention and defines space under a large pergola. 2. 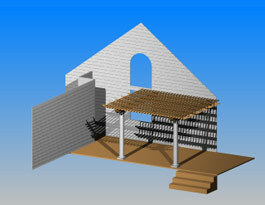 Color rendering of a three dimensional model of a pergola attached to a house shows shade projection and overall appearance. 3. 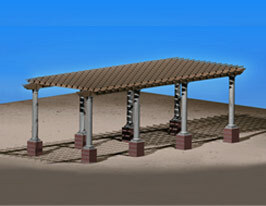 Initial concept sketch for a thirty foot columned pergola placed upon brick piers. 4. A pergola set close to a house, with an unusual yet succesful positioning of the columns, strongly defines an outdoor space. 5. A small space, partially enclosed with open lattice panels, creating a "pergola room". 6. 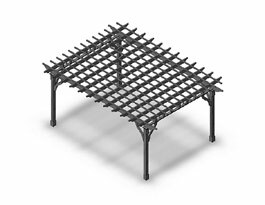 Our standard Bedford Pergola, increased to 11 feet x 15 1/2 feet, presented in a three dimensional model. 7. This simple pergola, placed in front of stairs leading to a deck, incorporates asymmetry and a two level superstructure. 8. A large pergola, placed on a stonewall over a courtyard, accommodates an asymmetrical entrance and exit axis. With a clear span of 19 feet, it incorporates many keystoned arches. 9. A model showing spacial relationships within a front porch area includes interesting trellis work in combination with traditional brackets. 10. 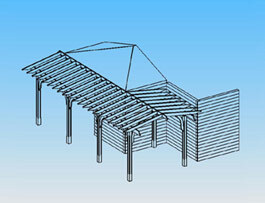 A large pergola incorporates a special "T rafter" developed for added shade. The purlins are placed every 6 inches for additional shade. 11. A narrow pergola designed to frame and accent a garden area. 12. 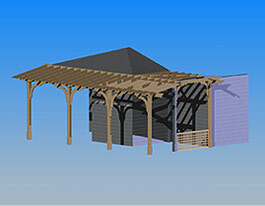 Example of first draft construction drawings showing details and size relationships of a large formal pergola with 8 inch x 8 inch wood posts and a plinth base. 13. These two drawings, Nos. 13 and 14, depict different solutions for an overhead structure for a side entrance. This solution creates a small sitting area behind the lattice panel. 14. This solution establishes a slightly more grand entry using a symmetrically peaked top and brackets.